All transactions are safe and secure with a reliable history in online purchasing behind each of our associates. Buy the Transformers Polo Shirts to own Transformers clothing and merchandise. 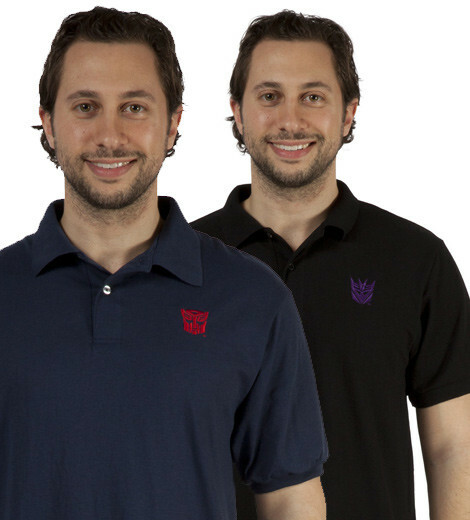 These popular Transformers Polo shirts are available in both Autobots and Decepticons styles. The embroidered logo design is great for business casual attire that is perfect for work, a round of golf, or whenever you need to be formal but still want to have fun. Choose to represent good or evil and wear one overtop of your favorite Transformer t-shirt, including an Optimus Prime or Megatron tee. They're prefect for any fan of the classic cartoon and movies. Pair a polo with a Transformers cartoon tee for the perfect gift combination. In addition to the Transformers Polo Shirts above, browse the Transformers Clothing Gallery for more apparel like men's and women's clothes, kids shirts or hoodies.